“She wasn’t actually on the ground,” said local woman Marion Fairley, interviewed on Fox’s ‘Sightings’ TV show, in 1992. ”She was kind of floating, but she had her face away from me. But it definitely was a woman.” A rather more dramatic experience was noted by Dennis Roberts, in the same broadcast. “What we saw just at the corner of the graveyard, up at the foot of the Castle wall, was a Green Lady. A lady dressed in green …Seven or eight of us ran up to see what was going on. Covering twenty five yards, there was nobody in either direction”. The object of their attention? 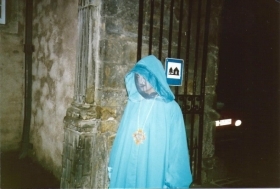 None other than Stirling’s most famous phantom, the mysterious Green Lady. Reports of her ghostly footsteps were once commonplace among staff and soldiers at the Castle - padding across the ceiling of the King’s Old Building at Stirling Castle. A near impossible route, now, but until a brutal re-modelling of that structure, following a fire in the 1840s, there had been a walkway at this spot. According to tradition, a relief sentry ascended the stairway to this narrow walkway sometime in the 1820s, only to discover his predecessor dead at his post, a look of terror on his face. He must, the story goes, have met the gaze of the Green Lady – for to do so is to invite death before the dawn. Various origins have been suggested for the Green Lady. The most popular is that she was a maidservant who rescued Mary, Queen of Scots, from a burning bedchamber in the Castle. Such a fire did occur, when a carelessly positioned candle set Mary’s bed-curtains ablaze – that much is recorded in the ‘Calendar of State Papers’ for 1562. No account of this mishap, however, makes mention of the Queen’s loyal rescuer. If, indeed, such a lass ever existed. Some versions of her story record that the maidservant had prophesied a threat to Mary’s life, and it was she who positioned the tottering taper – the better to keep watch over her mistress. Her reputation as a harbinger of doom, then, may be penance for accidentally creating the catastrophe which threatened the Queen and robbed the poor girl of her own life. Faery legend gives account of another green-garbed spirit with the gift of fatal prophesy, the Bean Nighe, the ‘Washer at the Ford’, in the old tongue – a near-relation to the Irish Bean Sidhe, or Banshee. She was said to wanders near deserted streams, where she washing the shrouds or grave-clothes of those who are about to die by violent of unexpected means. If a mere mortal discovered her at her labours they might ask a boon – to know the hour and manner of their own deaths.